The specialised field of Pedorthics, provides appropriate footwear, footwear modifications, orthotic therapy and any advice or information which benefits and, or assists the individual to maintain or improve their independence. WALKING...... for most of us, came pretty easy and without our knowledge. It did however, take about one whole year to develop the strength and skill to do so. The ability to move from one place to another with only the thought to do so, has, for countless generations enabled us to hunt for food, find new pastures, escape from predators, and challenge our foes. In recent times, the reasons to mobilize are a little less life threatening, but none the more important. We now live longer and as a result of increased ageing, our bodies decline in both strength and movement. Our independence becomes compromised and the need for other's to help, becomes necessary. 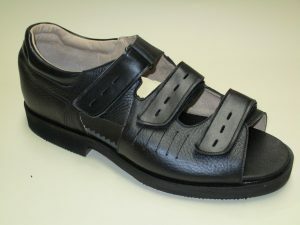 FOOTWEAR SOLUTIONS will help you maintain the ability to stand and ambulate comfortably. The Pedorthic approach to your needs, assists with a reduction in discomfort and pain through choosing the correct footwear, providing the appropriate modifications to those footwear and ensuring you have the best information to achieve those goals. HOW DO WE ACHIEVE THOSE BENEFITS FOR YOU? 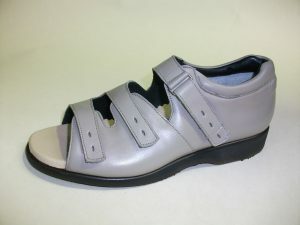 Custom Footwear, unfortunately is expensive and clinically prescribed footwear, where your footwear design and set-up are defined by your health and lower limb needs, is more often than not, an added expense for you, or family. Our Responsibility to you as a health provider in the Pedorthic field is to ensure our service not only meets your clinical needs, but informs you of any financial assistance that is available for this category of footwear, including all processes you require to obtain these benefits. 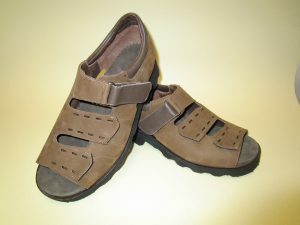 For examples of what our custom footwear can provide please view "OUR FOOTWEAR" page. With the help of you, our valuable client and our referring specialists, including Podiatrist and clinical Physicians we have developed the Medi-Depth footwear range to accommodate many footwear problems. So if you have in-shoe orthoses, bunions, clawed toes, swelling, arthritic changes, diabetes complications, corns and callouses, lower limb injury, or hard to fit feet, the Medi-Depth range could be an immediate answer to your needs. In size from 3-12 ladies and 5-15 mens. Sandals, shoes and boots. Sourced from Australian based suppliers, these footwear will provide you comfort through multiple fitting and size selections. Combined with material and fastening choices they are designed to address many conditions which cause pain and discomfort of the foot and lower limb. This is the engine room of Footwear Solutions, where all the machinery, materials and components required to do, what we say we can do, are stored. Trusty old and modern new machinery combine, to provide us with everything we require to build, change, modify, polish or repair your footwear items. Meeting all Health and Safety regulations ensures you and our staff remain safe. Parking to the front door and air- conditioned waiting and assessment areas, provides you comfort during your time with us. An educated and honest appraisal on the footwear requirements and costs so you can plan what will work best for your situation. A service based on listening to your needs and providing easy to understand information to assist you on all related aspects, including expected outcomes and time frames for completion. We are very happy to talk to you about what we offer and how we can help. Get in touch if you would like to find out more or book an appointment.